We have reviewed multiple camp-friendly sleeping accessories on this website including air mattresses, mattress pads and hammocks. Regardless of the wonderful things I have had to say about each of those options and the fact that I have used and will continue to use each of those options in specific circumstances, my number one favorite sleeping accessory for stationary car camping is a cot. 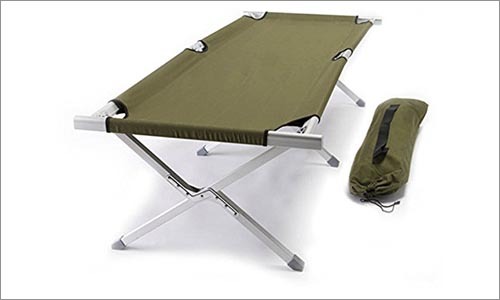 If you are like me and are looking for a warm, dry, comfortable place to sleep when you are camping, a cot may be just what you need. Unlike the traditional cot of decades ago, cots are now available in many different styles. Some are built for basic use, some feature exciting functions, and many are built to accommodate attachable tents. 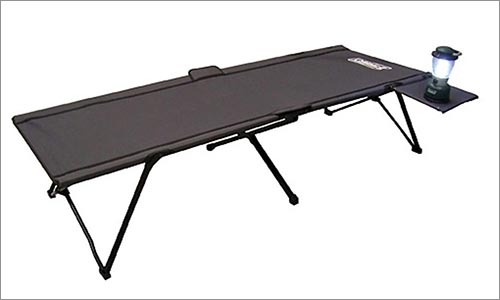 On this page you will find my reviews of today’s most popular top selling camp-friendly cots. I selected each of these cots after hours of research and chose them based on their specifications, sales statistics, and consumer ratings. I then went through and compared them to each other on all of these factors and compiled the reviews you will see further down this page. I’ve also included some information about the best uses for each of them so that you can easily select one which suits your specific needs. To make your search even easier, I decided to select the best three camping cots and place them up here in their own private section. In my opinion, the following three cots exemplify what it means to be the overall best, the best value, and the best two-person cots. If my opinion isn’t enough to convince you, you should know that my research revealed that these three cots had received the best consumer reviews for their respective categories. On the off chance that one of these does not fit your needs, I have included reviews of six other very impressive camp-friendly cots a little further down this page. If the terms “military-style” and “aircraft grade” do not indicate quality, I am not quite sure what does. That being said, many companies love to throw words like this into the names and descriptions of their products to entice you to purchase them without looking further into their actual quality. Trust me; I wasn’t swayed by these words. However, I will say that, after reading extensive consumer reviews and looking over this cot’s specifications, I can see why World Outdoor Products felt confident in using these terms. This exceptional cot is built of strong, lightweight anodized aluminum. It can handle a 400 pound weight load and easily folds up into the convenient stuff sack which comes with it. I must say, I was impressed that it weighs almost half the amount of many other similar cots and can handle a higher weight load than those heavier ones. It definitely shows that you need not sacrifice ease of transport for strength and durability. Unlike the typical canvas cot of days gone by, this Coleman ComfortSmart has truly been built for comfort. Instead of sleeping atop a slightly flexible piece of fabric, this cot allows you to rest comfortably atop a thick mattress pad. The pad itself sits atop a strong wire grate which offers a little bit of flex while simultaneously supporting up to 300 pounds. Less than half the price of many of the other cots on this list, this strong, well-cushioned option was a clear choice for this “Best Value” category. Not only is it extremely comfortable and capable of handling decently high weight loads, it has also received stunning consumer reviews. People couldn’t stop talking about how impressed they were with the rest they received while sleeping on this cot, which tells me that it not only looks comfortable but actually is comfortable. Measuring 30 inches wide when fully assembled, the ComfortSmart Deluxe is large enough to allow you to roll over in your sleep without worrying about falling onto the floor. At 80 inches long, it can easily accommodate someone up to about 6 feet 3 inches – taller if you like sleeping curled up on your side. You may be surprised to know that there are more impressive qualities and features to this cot than its price, its great reviews, or how comfortable and large it is. In order to fully explain why I selected this cot above all the other budget-priced cots for this position of Best Value, I will have to devote an entire page. This Disc-O-Bed is one of the coolest camping accessories I have ever seen. The moment I laid eyes upon it and realized the number of amazing features it had, I knew I had to find a place for it in this Top Three list. In fact, I was so impressed and excited that I literally called my husband over to read about it and watch the demonstration videos I found online. I bet I’ve got you interested now. You are probably wondering, “Why would a cot need demonstration videos?” It all seems rather straightforward, doesn’t it? Buy a cot, open it up, sleep on it. Why would anyone need a demonstration video? As I am sure you must have guessed by now, this is no typical cot. The Cam-O-Bunk is two cots in one. While some other cots are simply wide enough to fit two people, this one takes things a step further and stacks them to create bunk-cots. Yes, I said bunk-cots. I know it sounds crazy, but it is actually rather brilliant, if you ask me. If your tent is large enough to house bunk cots you can free up an incredible amount of floor space for other uses by bunking them up. However, if it is not, you can always disassemble the contraption and simply place them next to each other as you would do with two regular cots. If you worry that stacking these cots into bunk beds may be unsafe, rest assured that they have been tested and found capable of holding up to 500 pounds each. That means that you can place five hundred pounds on the top bunk and five hundred pounds on the bottom bunk without collapsing the framing or fabric of this cot. There is much more about the Disc-O-Bed that I am bursting to tell you, but I simply lack the space to do so on this page. If I were to begin listing all of its other great qualities and functions (yes, there are more functions), it would probably take over the page and forget about all of the other cots I want to include here. Wander over to our dedicated page for the Disc-O-Bed and see just what I mean. I am obviously most impressed with the three cots listed above in our Top Three section. However, each of those cots has been built with a very specific consumer in mind. The cot named Overall Best was built for someone looking for a rather basic, high quality cot which is reliable and gets the job done without leaving him or her with any worries. The Best Value cot was built for someone who doesn’t want to sacrifice quality for affordability, but who also needs to adhere to a strict budget. The Best Two Person cot, as impressive and awesome as I find it to be, may be a little more cot that a lot of people are looking for. If you didn’t find that any of the Top Three choices suited your needs, do not worry. The truth is that everyone has different needs and different priorities. I believe that one of the following six alternatives is likely to fit those specific needs of yours. Each and every one of these cots is a top seller which has received very positive reviews from consumers. When I was talking about specific needs in the little blurb at the top of this section, this is what I meant. This Kamp-Rite cot comes with its own tent. Although some others come with the option of attaching a small one-person tent to the top of the cot, this one actually provides you with that tent. For those who are unfamiliar with tent cots, allow me to explain quickly that they allow you to attach a tent on top of them so that you can pull yourself up off of the ground without having to purchase an oversized tent that can fit a cot inside of it. The cot portion of this ensemble features a foam mattress pad designed to increase comfort and add extra insulation to keep you warm during cool nights. The full sleeping area measures an astounding 90 inches, or 7.5 feet in length. Although some of that space will be slightly unusable due to the small angles of the tent corners, it will still allow people of above-average height to manage a comfortable night’s sleep without having to sleep curled up on their sides. With the tent removed or collapsed, you can easily slide either end of the cot into a sloped position, creating a lounge chair for mid-afternoon siestas. Personally, I find this appealing. My storage trailer isn’t very big and my car is always packed full of children, pillows, and stuffed animals, so I greatly appreciate any two-in-one, space saving device I can bring along. The Kamp-Rite easily folds open and closed. Its tent can be pitched in mere minutes and measures an incredible 36 inches in height, allowing for a massive amount of headroom for a one-person tent. If you are taller than average, roll over a lot in your sleep, or simply enjoy a lot of sleeping space to call your own, this Teton Sports cot may be just what you are looking for. Whereas most cots measure somewhere around 80 inches in length, this one offers an astounding 85 inches of horizontal sleep space. Five inches may not sound like much, but it can make a world of difference to someone who is taller than average. Most other cots measure about 30 inches in width. This cot puts them to shame by offering an incredible 40 inches of space. Though it would be difficult to squeeze two people into this cot, you will find that, as an individual, you will have more than enough room to toss and turn as you please. You may also be happy to hear that this cot can accommodate up to 600 pounds of weight. Whether you weigh a little more than average or are planning to try to squeeze two people in this cot, this weight limit should be more than enough to satisfy your needs. Keep in mind that this cot is much larger than the average cot. You may have a difficult time fitting it into a small two to four person tent which would normally accommodate a single, regular-sized cot. If you do not want to purchase an oversized tent, however, you can also consider purchasing a one person tent with similar dimensions. The Teton has been built to accommodate the use of an external tent, which means that you could easily set up a single tent and attach it to the top of this cot instead of the ground. 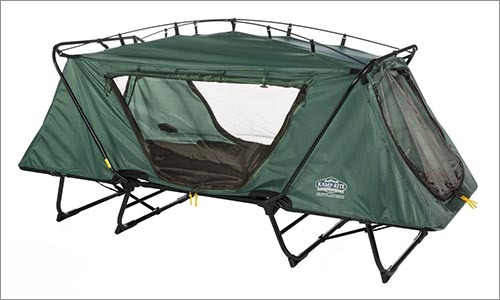 The Teton Sports Outfitter features an easy-to-use structure which allows you to fold its legs beneath it before folding up the entire system for quick storage. Don’t worry about having to remove legs and reattach them at a later date as you would with some other cots – this one was built with convenience in mind. 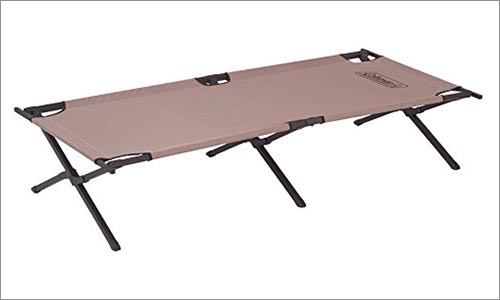 Like the Teton described above, this Coleman cot will allow you to attach a tent to its sleeping surface so that you will not need to lug around a large tent built to accommodate its size. Instead, you can choose to purchase a small, one person tent and simply tie it onto the top of this cot in the indicated spaces which have been cut out of the sleep surface to expose the frame. This is yet another easy-setup cot which can simply unfold into the correct, upright position in less than a minute. 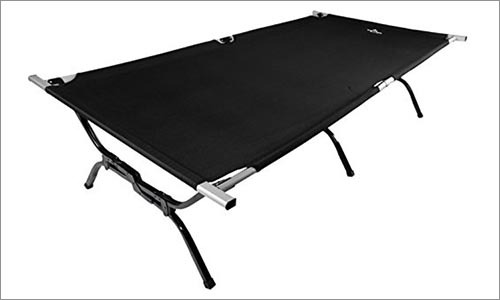 No need to fuss around with detachable legs or trying to stretch the sleeping canvas around the frame. Instead, you will be set up and ready to go in mere moments. Takedown is just as easy. The leg supports fold at a fulcrum (meeting point), allowing you to fold up the entire cot for storage. With a 300 pound weight limit and measuring only 75 inches by 35 inches, this is one of the smallest cots I’ve included on this page. However, if you weigh less than 300 pounds and aren’t any taller than about 6 feet, this cot’s small size shouldn’t cause you any problems. In fact, the size actually makes it easier to fit in most tents. If space is of concern to you, you will also be happy to hear that this cot sits rather low to the ground, allowing for more headroom in short tents. If you are looking for accessories and convenience you may be rather impressed by this Coleman cot’s fold-out side table. Not only will it allow you a convenient place to set your most important camping possessions as you sleep, it also includes a mesh cup holder so that you can keep your water nearby all night without worrying about spilling it. 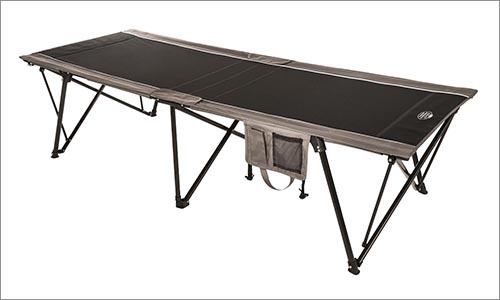 W-shaped supports beneath this cot evenly distribute weight so that excess weight on one or two of the feet does not cause it to puncture through your tent floor. To further protect against punctures and to hold your cot in a steady place all night, Coleman added rubber feet to each of the legs. This cot is slightly longer than many other single-person cots, but maintains an average width. At 80 inches long, it can easily accommodate someone about 6 and a half feet tall. However, its 32-inch width means that it will not be suitable for those with very wide frames or people who simply like to roll around a lot in their sleep. 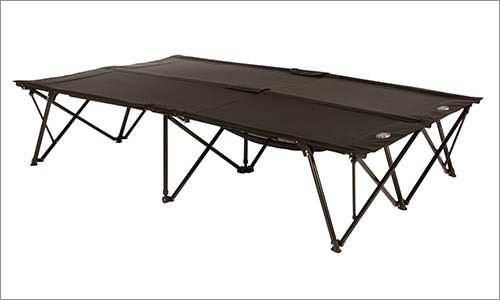 That being said, it would have been difficult for Coleman to make it much wider without limiting the types of tents it could be used in, since its foldout table adds another 8 inches to its overall width. Consumers have been rather pleased with the Coleman Pack-Away, stating that although its sleeping surface maintains its shape and supports you well over time, it does not feature an uncomfortable center support bar. Many consumers have also talked about enjoying the height, stating that it is taller than an average cot and allows them to store things beneath it. This Kamp-Rite doesn’t lie when it says that it is oversized. Inches taller than most other cots, this one allows for significant storage space beneath your sleeping surface. For those with tall tents, the height of this cot will equate to more floor space as they will be able to tuck things beneath it. People with short tents may find this cot’s height to be an issue and may lack adequate headroom. Be sure to check your tent’s measurements against the measurements before making a commitment. This cot does not feature the typical middle support bar which most people complain about digging into their back at night. Though this should come as a relief, it is important to note that the material on the sleep surface is likely to sag a little as time goes on because this support is missing. Though it won’t sag nearly as much as a typical hammock, the effect on your body will be similar. If you not comfortable sleeping on a hammock, I would not suggest this cot. On the other hand, if you are comfortable with such sleeping conditions, this may actually be quite a relaxing option for you. Two storage side pouches will hold your most important items throughout the night. In case of an emergency, you will always know where your keys are. In case of a midnight bathroom break, you will always have a flashlight on hand. 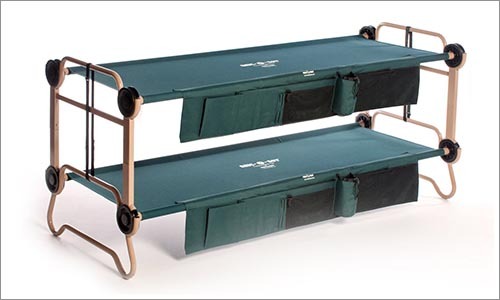 The second Kamp-Rite cot on this list, the Double Kwik, is exactly as it sounds to be – built to accommodate two people and very easy to set up. This large cot measures 55 inches across, allowing enough room for two people to easily sleep side by side without interfering with each other’s space. Measuring an astounding 85 inches in length, this cot is much longer than most of the others featured on this list. While this may cause problems for people with small tents, it will be very important for taller-than-average individuals, as it will accommodate someone up to about 7 feet tall. Of course, to accommodate a cot of this size, you will require a tent with significant floor space. If you find that your tent is tall, but not very long or wide, you may want to look into a different two-person option, such as the one listed in our Top Three section at the top of the page. Convenient mesh netting hangs beneath the Kamp-Rite, allowing you to store important items such as flashlights, car keys, and cell phones safely nearby as you catch some rest. This cot’s nylon sleep surface is very breathable, allowing for a cool and comforting night of sleep. Personally, I would much rather sleep atop a breathable surface and have to add blankets or a sleeping bag on cool nights than to sleep atop an insulated surface and suffer through the heat on warm nights. 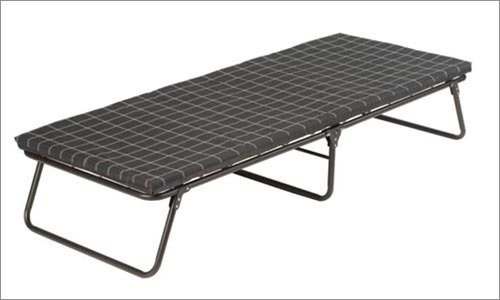 Remember to always keep your personal needs in mind when selecting the right camping cot for you. A good night of sleep sets the tone for a good day, especially when you are roughing it out in the wilderness. Remember to consider things such as the space in your tent, your weight, your height, any back problems you may have. If you aren’t certain that it is a cot you would like, take a moment to read over our Camp Sleep Guide where we discuss other options as well, including air mattresses, hammocks and mattress pads.